Dr Sue Baker is a Research Fellow in forest ecology and conservation biology. She studies a wide variety of biodiversity groups and ecosystem processes and supervises several research students. Her research aims to improve conservation of forest biodiversity through developing better logging practices and reserve networks. Sue’s time working for the forest industry provides important practical background, enabling her to work very closely with forest management agencies in Australia and internationally to translate research findings into management outcomes. Sue is a globally recognised expert in retention forestry practices. She also participates in marine research as a volunteer diver with Reef Life Survey Foundation. 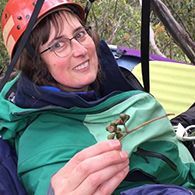 After completing her BSc (Hons) and PhD studying responses of beetles to forest management practices, Sue worked for Forestry Tasmania for five years developing and researching variable retention as an alternative to clearfelling. Her work demonstrated benefits to plants and animals of this new logging system, which is now adopted in Tasmanian high conservation value forests. In 2010, Sue was awarded a forest industry scholarship to spend a year in the International Fellowship Program at the World Forest Institute in Portland, USA where she conducted the project ‘Seeking a balance between forestry and biodiversity – the role of variable retention silviculture. Insights from western USA and Canada’. On her return to Australia, Sue received an ARC Postdoctoral Fellowship (Industry) for an ARC-Linkage project ‘Managing variable retention harvesting to maintain forest biodiversity – effect of forest influence and successional stage on recolonisation’. During this time she was awarded the Fulbright Australia post-doctoral scholarship to conduct plant and beetle surveys in USA. Sue’s current position is Research Fellow on the project ‘A new integrated approach for ecologically sustainable forest management’. This ARC-Linkage grant partners with Forestry Tasmania and VicForests. Sue’s love of adventure and conservation volunteering has included conducting seabird surveys in Antarctica and Macquarie Island, and dive survey expeditions to awesome places like Galapagos Is., Okinawa (Japan), Rose Atoll (American Samoa), Raja Ampat (West Papua) and Arnhem Land (Australia). Sue participated in a primary schools forest education project, the Expedition Class Tree House Challenge. This video was produced by Daisy Pyefinch from Lenah Valley Primary School. LVPS Treehouse Challenge (made by Daisy) from David Pyefinch on Vimeo. Sue’s role as Research Fellow on two ARC Linkage grants has involved managing large projects with multiple staff and students. Sue has experience giving lectures and running practicals for undergraduate students at UTAS. She loves to enthuse students about field-based invertebrate collection and laboratory identification. She also enjoys working with school groups. Sue attended the International Educators Institute in USA in 2010 (a week-long study tour for teachers and natural resources professionals). Sue’s research is closely aligned to the University’s research theme ‘Environment, Resources and Sustainability’. She is interested in understanding the spatial (from local to global) and temporal impacts of harvesting systems and conservation measures on plant and animal habitats and populations. By studying the impact of various commercial logging practices on key indicator groups, results can be synthesized into recommendations for management practices necessary for effective conservation. Sue works collaboratively with scientists and industry professionals to develop policies, practices and monitoring systems that can achieve these objectives in a practical way. Her research has resulted in ~50 journal articles including two in Nature. Sue’s honours and PhD research focused on the extremely diverse communities of beetles that inhabit the forest floor. She showed that ground-active beetles are highly sensitive to forest management and environmental gradients such as edge and riparian effects. Her edge effects research is used to inform reserve designs in forestry areas. Sue continues to research beetles, but has expanded her scope to other biodiversity groups to build a more unified view of management impacts on biodiversity. Sue is an internationally recognised expert on variable retention silviculture and has participated in several international collaborations including leading a global field study of biological responses to this harvesting approach. She previously worked for Forestry Tasmania as a conservation biologist and developed and researched variable retention as an alternative to clearfelling in wet eucalypt forests. The ‘aggregated retention’ logging system went from concept to operational practice around Tasmania and Sue’s research has shown that outcomes for biodiversity are better than with traditional clearfelling. She received World Forest Institute and Fulbright Postdoctoral fellowships to study variable retention in North America in 2010 and 2012. Sue co-ordinated an ARC-Linkage grant investigating the ecological basis for a management ‘forest influence’ target aiming to facilitate biodiversity re-establishment following harvesting. A team of students and researchers surveyed birds, beetles, plants, bryophytes, microclimate and habitat variables along transects into regenerating clearfells; also documenting how communities changed with forest succession. Proximity to unlogged mature forest was found to facilitate recovery of nearby harvested areas, but different spatial and temporal scales of recovery were evident for the taxa surveyed. Sue is currently co-ordinating an ARC-Linkage grant that is investigating cost-efficient approaches to monitor forest biodiversity: metabarcoding for beetles, automated call recognition for birds from acoustic recorders, and remote sensing for plants. (http://onlinelibrary.wiley.com/doi/10.1002/eap.1406/abstract). Lena Gustafsson, Jerry Franklin, Tom Spies, Charlie Halpern and Bill Beese have been influential collaborators and mentors. 2012: Fulbright Australia Post-doctoral Fellowship to conduct research with the University of Washington Seattle and the Washington Department of Natural Resources. 2012: UTAS Faculty of Science, Engineering and Technology Research Excellence Award. Awarded to the Plant Evolutionary Biology Research Group. 2010: ARC Post-doctoral Fellowship – Industry. 2010: Gottstein Trust/FWPA/WFI World Forest Institute Fellowship, Portland USA. This ARC-Linkage grant with Forestry Tasmania and VicForests is in progress, with four PhD students and several honours students. The project will develop new, more efficient ways to measure forest biodiversity (machine learning recognisers for bird calls from acoustic recorders, metabarcoding for beetles and remote sensing for plants). Collaboration with experts in decision science at Melbourne University will create new models that will allow forest managers to decide where and when to harvest or reserve forests. Dr Sue Baker has numerous publications on various aspects of ecologically sustainable forest management. She has also published in the fields of forest pest management, Antarctic science and global marine conservation. She focuses on publishing in top-quartile journals, including Nature, Biological Conservation, Ecological Applications, BioScience, Forest Ecology and Management, and Conservation Letters. A recent major contribution was a cross-continental study of retention forestry and biodiversity (http://onlinelibrary.wiley.com/doi/10.1002/eap.1406/abstract). Sue is a member of the editorial advisory board for Forest Ecology and Management and regularly reviews papers for various academic journals and book chapters. She has reviewed ARC funding proposals in the Discovery, DECRA, Future Fellowship and Linkage programs. As well as numerous smaller grants and fellowships, I co-wrote two successful ARC-Linkage grant applications. For the first of these I was a named investigator and recipient of an ARC Postdoctoral Fellowship – Industry: LP1010050, ‘Managing Variable Retention Harvesting to Maintain Forest Biodiversity - Effects of Forest Influence and Successional Stage on Recolonisation’. I co-wrote the application for our second Linkage grant and was subsequently employed as the research fellow: LP140100075, ‘A new integrated approach for ecologically sustainable forest management’, $410,933 (Jordan, Burridge, Lucieer, Karpievitch, Vesk, Wardlaw, Powell, Spies). This project will model the impacts of forestry management practices on the composition and succession of soil microbial communities, and investigate their links with regenerating plant communities. The soil microbiome and plant community will be sampled across a logging and burning severity gradient at four points in time. By extracting soil DNA and sequencing the 16SrRNA and ITS regions, the biodiversity of the bacterial and fungal communities can be characterised. This project will focus on important taxa involved in symbiotic and pathogenic relationships with plants, and free-living taxa that are responsible for the availability of essential plant nutrients, such as nitrogen and phosphorous. I aim to develop an index to classify forest maturity that can be used by the managers of Tasmania's wet eucalypt forests to efficiently and economically classify forest stands. The project will initially investigate which biological and structural variables are associated with wet eucalypt forests of different successional stages, and whether these variables can be used as indicators to define maturity level. I then aim to develop a statistically derived, quick and easy to use index that describes forest maturity.